We’d love your help. Let us know what’s wrong with this preview of Monster by Diane Hoh. Rumours are flying around Salem University - a monster is stalking the campus. Striking in the dead of night, it leaves its victims bloodied and traumatized... But surely it's just a prank gone wrong? A monster is attacking students at Salem University. At first, it is believed to be just a rumour, or a fraternity prank. However, when Abby's friend is attacked, the group of friends realise how serious it is. There's not much more to the story than that; the book's enjoyment is firmly placed on the idea that the reader is kept guessing at who/what the monster is. Unfortunately, I think I read this book twice when I was younger and I remember the twist. 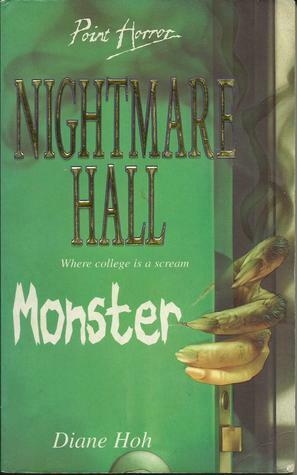 Therefore, this time I found it rather dull A monster is attacking students at Salem University. At first, it is believed to be just a rumour, or a fraternity prank. However, when Abby's friend is attacked, the group of friends realise how serious it is. Therefore, this time I found it rather dull, but seem to remember liking it quite a lot in my youth. There's a few people Abby suspects to be the monster, but these characters aren't developed enough for you to really suspect them. I liked MONSTER. It was creepy and cheesy and spine-tingly and it hit right for old school YA horror. I just want to know who’s taking chemistry as a 100/200 level class if they don’t actually have to? Talk about torture. Another bid to my thinking that the Nightmare Hall books don’t really know whether to be high school or college. While I’m sure chemistry’s offered at college level no one would actually subject themselves to that unless it was required for a major or minor. Ick. So a monster is I liked MONSTER. It was creepy and cheesy and spine-tingly and it hit right for old school YA horror. So a monster is supposedly stalking the campus and attacking people but most don’t really believe it. Until someone in their circle of friends is attacked and he swears it was really some kind of beast that did it. Soon “proof” starts turning up in the form of clumps of coarse fur but even then Abby can’t be bothered with it too much because she’s spread herself out a bit too thin as it is. On top of stuffing herself full of school in order to maintain her scholarship she’s working part-time in the cafeteria and her boyfriend of multiple years is slipping away from her because she doesn’t make time for him. So much on her plate! I really like Hoh’s ability to build suspense. It feels natural and organic to the story and she’s good at misleading you down one path to the truth when really it’s another path entirely. I’m sure the more Nightmare Hall books I read the more formulaic this will get but for right now it’s refreshing and lends itself to the scare factor of the story. With MONSTER you do get a supernatural element to it and it’s kind of neat. Different but recognizable once that twist is revealed. It’s even mentioned by another character, the familiar part to it, so you can’t miss it if you don’t immediately recognize it yourself. There are a few possibilities for who could be doing this but over the course of the story those suspects get whittled out and I think that lends itself to a greater level of suspense. WHO’S LEFT? MONSTER is what I think of when I think of YA horror. It’s cheesy, yes, but it embodies teen life (at least in the 90s), it has a heavy dose of suspense, a supernatural element, and a twist ending that you may or may not see coming. I didn’t see this one coming although, really, things aren’t all that subtle in hindsight. Isn’t that always the truth? Still, I really liked MONSTER for what it was. The characters were believable; they weren’t caricatures of teenagers and how someone thinks they might interact. Abby is a genuinely good character that has too much on her plate but her intentions are nothing but admirable. Unfortunately things don’t always work out for her. I actually felt for them in the too-short story and yeah, it was creepy too. Knowing Diane Hoh's M.O., I already guessed the truth of what was happening after a few chapters. Still a good story. This one is very different from the others. It was okay, not my favorite. But still a fun read.